Warts are small, hard, rough, and not cancerous skin growths. They usually do not have any symptoms. Typically, warts occur on the feet and hands, but can also affect other parts of the body. Warts are similar in color to the skin. They can be single or appear in groups. Warts are more common in children than in adults. Warts vary in size and shape. A wart can be a bump or flat, with a rough or smooth surface. Small blood vessels reach the core of each wart. They can be seen as dark dots in the center of the wart. Warts are caused by the human papillomavirus (HPV), infecting the top layers of the skin. The virus infection results in skin growth, resulting in the formation of a wart. The known types of HVP are about 130. The HVP, causing warts enters the body through slightly damaged skin. The risk for development of warts is higher for people working with meat, using public showers, or having weak immune system. Warts are caused by low risk HVPs (1, 3, 26, 29, 57, etc. ), and high risk HVPs (31, 33, 35, 39, 52, 58, etc.). Skin tags are small, brown or flesh-colored, noncancerous benign tumors. They look like small, soft balloons, suspended on a slender stalk. Typically, they form in areas with skin folds, and where clothes rub the skin, like the armpit, neck, groin, under the breasts. They can also appear on the face. Skin tags can be single or grow in groups. It is possible skin tags to fall off spontaneously, but most of them persist once formed. people with hypertension (high blood pressure). The size of skin tags is typically 1.5-5 mm. However, bigger skin tags, up to 5 cm, can also appear. The cause of skin tags is still poorly understood. They are thought to occur from skin rubbing up against clothes or skin. Another factor is the influence of hormones. HPV is also a part in the etiology of the skin tags. Studies have shown that about 48% of the skin tags contain HVP 6 and 11. Wart: Warts are small, hard, rough, and not cancerous skin growths. Skin tag: Skin tags are small, noncancerous benign tumors. Wart: Warts are similar in color to the skin and vary in size and shape. A wart can be a bump or flat, with a rough or smooth surface. Small blood vessels reach the core of each wart. They can be seen as dark dots in the center of the wart. Skin tag: Skin tags are brown or flesh-colored. They look like small, soft balloons, suspended on a slender stalk. Warts: Warts are more common in children than in adults. Skin tags: Skin tags are more common in adults than in children. Warts: The risk for development of warts is higher for people working with meat, using public showers, or having weak immune system. Skin tag: The risk for development of skin tags is higher for overweighed and obese people, pregnant women, people with diabetes, hormonal imbalance, dyslipidemia, or hypertension. Warts: Typically, warts occur on the feet and hands, but can also affect other parts of the body. Skin tags: Typically, skin tags form in areas with skin folds, and where clothes rub the skin, like the armpit, neck, groin, under the breasts. They can also appear on the face. Wart: Warts are caused by low risk HVPs (1, 3, 26, 29, 57, etc.) and high risk HVPs (31, 33, 35, 39, 52, 58, etc.). Skin tag: Skin tags are thought to occur from skin rubbing up against clothes or skin. Hormones and HVP 6 and 11 are also a part in the etiology of the skin tags. Warts: Treatment of warts includes salicylic acid and cryotherapy. Skin tags: Treatment of skin tags includes cryosurgery, cauterization, surgical ligation, excision, electrodessication. Warts are small, hard, rough, and not cancerous skin growths. They are similar in color to the skin and vary in size and shapes. A wart can be a bump or flat, with a rough or smooth surface. Small blood vessels reach the core of each wart. They can be seen as dark dots in the center of the wart. Skin tags are small, noncancerous benign tumors. They are brown or flesh-colored. They look like small, soft balloons, suspended on a slender stalk. Typically, warts occur on the feet and hands, but can also affect other parts of the body, while skin tags occur on the armpit, neck, groin, under the breasts or on the face. 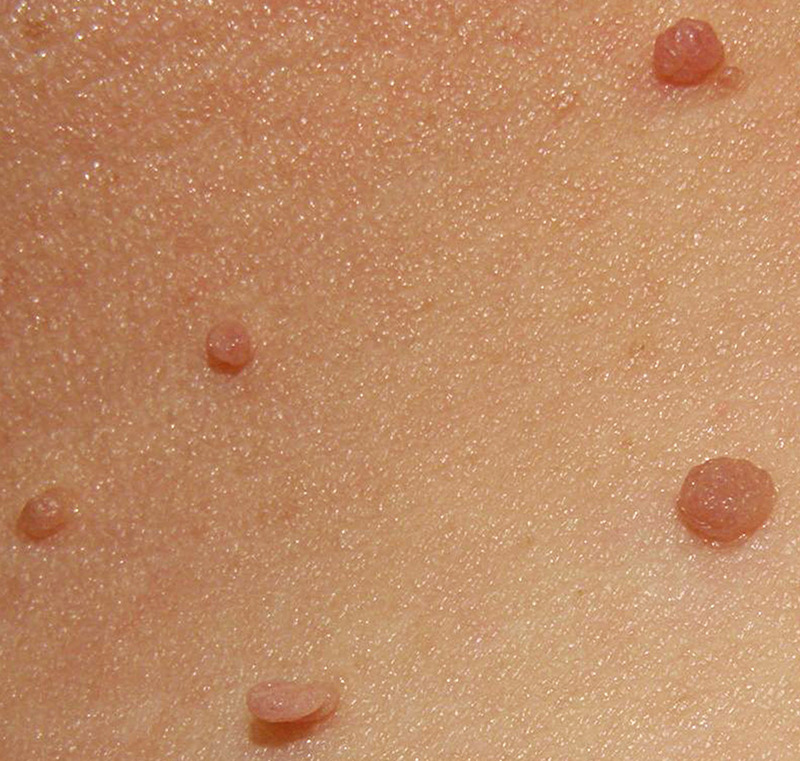 Warts are more common in children, while skin tags are more common in adults. The risk for development of warts is higher for people working with meat, using public showers, or having weak immune system. The risk for development of skin tags is higher for overweighed and obese people, pregnant women, people with diabetes, hormonal imbalance, dyslipidemia, or hypertension. Warts are caused by low risk HVPs (1, 3, 26, 29, 57, etc.) and high risk HVPs (31, 33, 35, 39, 52, 58, etc.). Skin tags are caused from skin rubbing up against clothes or skin. Hormones and HVP 6 and 11 are also a part in the etiology of the skin tags. Treatment of warts includes salicylic acid and cryotherapy. Skin tags can be treated by cryosurgery, cauterization, surgical ligation, excision, electrodessication. Dr. Mariam Bozhilova Forest Research Institute, BAS. "Difference Between Wart and Skin Tag." DifferenceBetween.net. February 26, 2018 < http://www.differencebetween.net/science/health/difference-between-wart-and-skin-tag/ >. 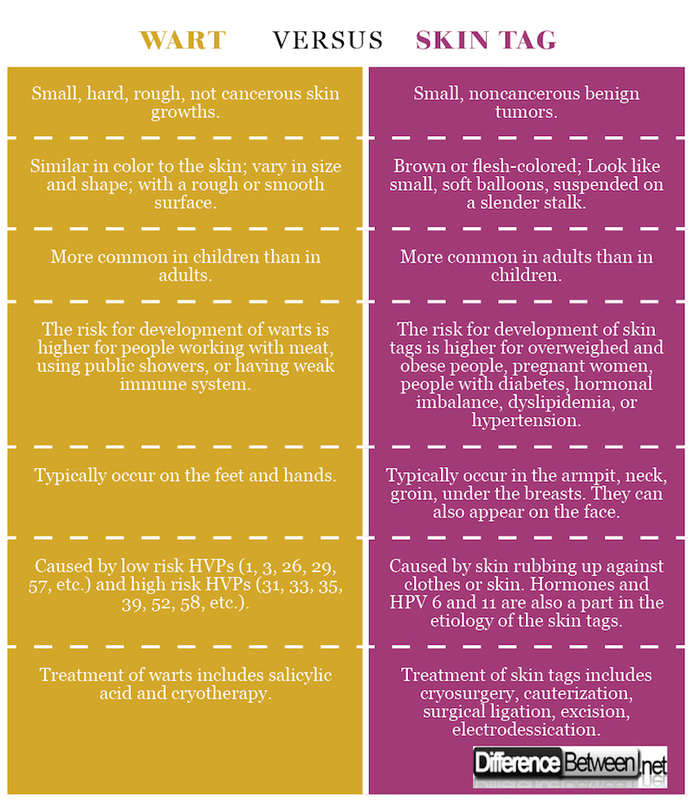 Nice info about skin tags and warts. These are the common skin problems. I really like this article so much. Thanks a lot for sharing. Cobo, F. Human Papillomavirus Infections. Amsterdam: Elsevier. 2012. Print. Gibson, C. No More Moles Warts or Skin Tags! Eire: CGI Enterprises LLC. 2010. Kindle Edition. Gupta, S., R. Aggarwal, S.K. Gupta, S. Arora. Human papillomavirus and skin tags: is there any association? Indian Journal of Dermatology, Venereology and Leprology. 2008 May-Jun: 74(3):222-225.